Unique et spacieux de 2 chambres / 2. 5 propriété de bain avec vue imprenable sur San Francisco Bay-couvrant de Tiburon, Angel Island, Oakland, San Francisco à Sausalito - de chaque pièce. Josephine Street est juste en haut de Bridgeway sur la «Gold Coast» de Sausalito. Romantique de luxe, couette, draps en coton 800 de comptage, coffre de cèdre, ainsi que l'Internet sans fil, lecteur iPod, téléviseurs dans le salon et chambre à coucher. Marcher dans la porte vous amène au paradis à 14 Josephine, bienvenue! Sehr gute Wohnung! Top Ausstattung. Von Sausalito aus kann man die Stadt, die Bay und die Küste sehr gut besuchen. Allison's home felt just like that, as you entered the door, "a home" that we were blessed to use; quite simply, a retreat from the crazy world around us. It was immaculate, but felt as if it welcomed us with open arms. Despite the weather being unusually cold for that time of the year, the views made up for it. 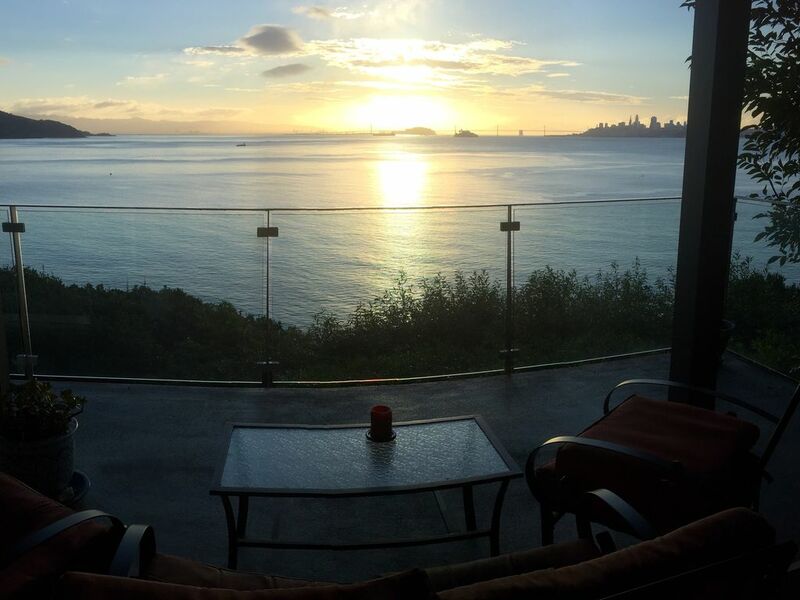 I woke early the first morning and witnessed the most beautiful sunrise on the bay. Then, later when it rained, we enjoyed the fire and a card game. As the weather cleared, we strolled the streets in town, shopping and enjoying the laid back community. Later, we took a $3.50 Uber ride to dinner. :) Back home, again, we enjoyed the simple luxury of this home, gazing out the window at the wide expanse of twinkling lights on the San Francisco buildings and the Oakland Bay bridge. Thank you, Allison, for creating this lovely home and sharing it with us. What a wonderful way to wake up in this amazing view. A wonderful place to sit around and do nothing, even in the middle of winter. We saw seals in the bay, hummingbirds in the trees, and could easily walk/run to the Golden Gate bridge. Hope to come back soon! AMAZING about sums it up.... from the awesome owners to the fully stocked kitchen (we found everything we needed) to the comfortable bedding, to the cozy expansive feel, to the heat lamp on the deck.... and oh did I mention the View... LOL... golden sunrise over the East Bay in the morning, shimmering moonrise over Angel Island at night.... Boats in the bay, birds flying by, city/bridges lite up at night. We had rain, we had wind, some clouds and crystal clear blue sky on Christmas Day.... ALL of which were AMAZING!!!! We were so sad to leave this spectacular place! Allison was the perfect host - always accessible before and during our stay. This was the best equipped place we have rented - everything you could need. The views are amazing. Two minute drive down the hill to downtown with lots of great restaurants. We got an Uber into the City for less than it would have cost for parking or the ferry for 3 of us. We will definitely be back! 3 minutes du Golden Gate Bridge juste au-dessus de l'eau.